Insane space shooter with twisted missions and cool weapons. Looking for a space shooter that will surprise you? Deadly Stars is that very game. 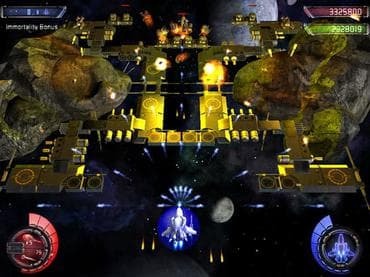 Featuring cool graphics, excellent sound effects and a groovy sound track Deadly Stars is going to immerse you into the atmosphere of intergalactic battles. The game employs an advanced upgrade and power-up system that allows you to buy new types of weapons, ammo, armor and batteries as you advance from one level to another. Fighting takes place in five distinct and expansive galaxies, with over 25 different enemy ships types to combat. Download free full version game today and see that it's an insane space shooter with twisted missions and cool weapons! If you have questions about Deadly Stars game, please contact us using this form.